One of the most important parts of an oral hygiene program is locating where active bacterial colonies are hiding. POH disclosing tablets turn the bacterial colonies bright red, allowing you to see where you need to clean. Try POH disclosing wafers and see what you are missing! Available in packages of 40 tablets (four strips, ten tablets to a strip). Contains Red #28, used for decades in preventive dental offices. 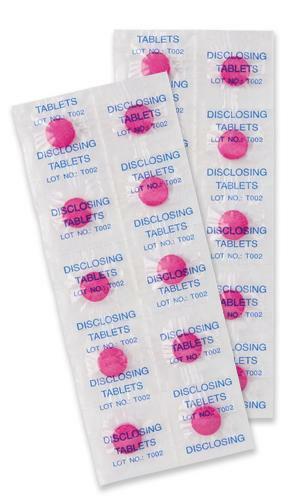 Use POH disclosing tablets to train youngsters (and not-so-youngsters) by dissolving one in the mouth and swish it around. Spit and look in the mirror to see the bright red colonies of bacteria. Clean the red areas with a toothbrush and dental floss. Rinse vigorously all areas of your teeth forcing water between your teeth. 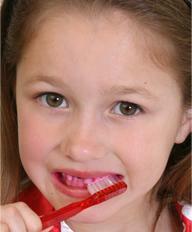 Inspect and verify you are cleaning the areas of your teeth. You can use a tablet before or after you have cleaned your teeth. Any bright red left on the teeth indicates where you might have missed.